Combine the butter, cream, sweeteners, cocoa, and salt in a small saucepan over medium heat and bring to a simmer. Simmer on low, stirring, for 3 to 5 more minutes after everything has melted, then remove from heat and stir in chopped chocolate or chocolate chips. Stir in vanilla. It’s now ready to ladle over ice cream, although it thickens more as it begins to cool, so you could also wait for 15 to 20 minutes before doing so, if it’s not too unbearable. Pour leftovers into a jar or jars and refrigerate. 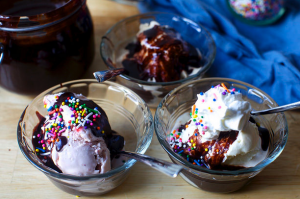 Hot fudge sauce keeps chilled in the fridge at least a month and often two, although it’s rare it lasts that long. This entry was posted in chocolate, cocoa, recipes, sauce, sweets and tagged bittersweet chocolate, butter, cocoa, cream, light corn syrup, vanilla extract by admin. Bookmark the permalink.